The first photo has some of the same characteristics as the one I presented earlier in the week: detailed boats complemented by simple foggy areas. But, in this one, I wanted to present the complex details of the mask fading into the simple lines of the boats’ hulls and finally the solid off white of the foggy background. I like the progression of complexity to total simplicity. I like both shots Patrick! The bottom shot may not have one individual clearly identifiable subject but is does have some nice rhythmic elements (the diagonal booms of the rigging and the horizontal sides of the boats to name two) and a nice overall dynamic composition. Also I found a lot of the details to be interesting and I like the tonality of the shot. This would make a great jigsaw puzzle wouldn't it? I like the first shot with the diagonals of the boats above water and the resulting reflection in the water. Nice tonal range throughout the photo. I think the photo could work as a geometric or abstract photo. There are some diagonals going on with the rigging and even the back of the boat houses. It's pretty busy, so landing on one thing is pretty tough here. The first thing I actually focus on is the white bucket. Again, I like the tonal values within the photo. Nice processing on those. I think both images have merit, for different reasons. The top image is more of an artistic shot, with all the negative space from a wider angle making the viewer really notice the shape and form of the shrimp boats and also, gives us information about what the environment that they exist in is like. 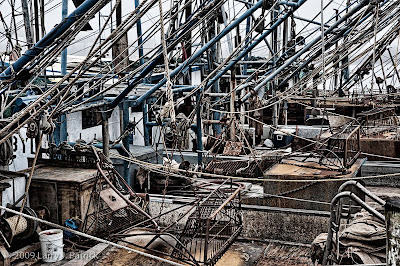 The second image is more of a closer-in detail shot and shows another reality of the scene, the busy and complicated rigging and all the nitty-gritty elements and I think gives the viewer another impression of what life is truly like on a shrimp boat. In this case I don't think you have to have one specific focal point, the whole idea of the shot is how busy and complicated it is. The shots are different perspectives and illustrates how a photographer can capture different "realities" of a scene by their choice of composition, crop, focal length, aperture, etc etc. I agree with Doug that your processing of these images contributes to those feelings for me. WOW! How do you do it? 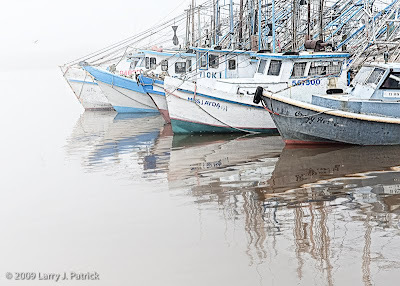 You look at the scene of the first image and compose this painterly photo of a wonderful scene and then you move around and hone in on all the nitty, gritty of a shrimp boat. I am glad you did not say anything about the camera setting or the post processing. What is striking about these two shots is that you saw two images so different in them. Thanks for making me think about what I should be doing. Yes, you can have a subject of complexity and details. It does however take the viewer longer to understand and many people will never completely get it. Good work stepping outside the box. Great contrast between the two photos. It might be interesting to know if people would be able to relate the two if you had not noted that they were of the same boats but only from different points of view. I like the second one because you do not see many photos like it. It makes me want to study all the details. Different but I like what you did. I like the one with all the details. Just for my own information, I would like a few details about this shoot. Like: how many boats were there? How long did you stay at this location? How many total photographs did you take to get these three shots? How did you pick this location? I often find myself saying, after I have left a place, "I should have. ." I like your work and your comments regarding how you got there. I agree with Sam, I would like to know this information. Also, how do you decide which photos to post? Good work here. I like all the images for different reasons. I really like the first photo with details sharp on the right side of photo fading out to the diagonal top left. Your previous photo and that one are very nice! As a detail oriented person...the second photo makes me crazy because my eye cannot settle on one thing, enjoy it and wander around the photo. Just the facts, sir!! It really would be a chaotic puzzle! !